As a judge for the FreeFrom Foods Awards 2016 and coming up, the FreeFrom Eating Out Awards 2016, I am thrilled that the competition has opened. For the last eight years, the hugely successful FreeFrom Food Awards have made a major contribution to the massive growth in FreeFrom foods in the retail section. Now, with regulations governing the declaration of allergens which came into force in food service at the end of 2014, there is now a focus upon ‘FreeFrom’ in restaurants, cafés, pubs, take-aways, canteens, schools, hospitals and anywhere outside the home that you might wish to eat FreeFrom food. Like the FreeFrom Food Awards, the FreeFrom Eating Out Awards will encourage innovation and celebrate excellence in the FreeFrom food service industry. The awards are entirely independent, supported by sponsorship and entry fees only. So if you know of excellent GLUTEN FREE eateries or have a favourite FreeFrom venue that you think might be interested in entering the awards please email Kathy with their details and she will send them a entry form. To celebrate the opening of the 2016 competition, the FreeFrom Eating Out Awards have given their new discretionary Pathfinder Award to Executive Chef Dominic Teague and Indigo for their ground breaking work in catering for those on FreeFrom diets. Executive Chef Dominic Teague @Indigo, One Aldwych Hotel, London. A year ago Indigo at One Aldwych hotel, Covent Garden, after brief closure for a kitchen refurbishment, launched a brand new, entirely gluten and dairy free menu – but the team did not tell anyone what they were doing. And…. Nobody noticed! None of their regular customers who had been using the restaurant for years; none of the new visitors who came to see what the revamped menu had to offer. All they talked about was the deliciousness of the food! In October, Indigo ‘came clean’ and the ‘FreeFrom’ world went wild – and Indigo’s bookings shot up by 30%. The FreeFrom Eating Out Awards were launched three years ago to show that creating GLUTEN FREE, DAIRY FREE and allergen free food that would be as good, if not better, than ‘normal’ food was completely possible: Indigo has most certainly proved that they were right! If you are a member of Coeliac UK, they produce a comprehensive directory which covers over 16,000 food and drink items. This is available in a paper-based Manual and online FREE to members of Coeliac UK. SIGN UP so you do not miss out on further updates to the Chocolate Bar listing (My TOP post) as well as new Restaurant Reviews, Travelling experiences, Food Shows, Product Reviews and (occasional) Recipes. Also check out my posts on GLUTEN FREE Ice Cream,GLUTEN FREE Advent Calendars, GLUTEN FREE Mince Pies, GLUTEN FREE Easter Eggs and GLUTEN FREE Valentines Treats. 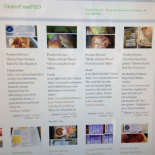 This entry was posted on June 20, 2016 by glutenfreepsd in News & Views, Restaurant Reviews and tagged FreeFrom Awards, FreeFrom Eating Out Awards, FreeFrom Foods, Gluten Free Awards, Gluten Free London, Indigo, One Aldwych Hotel.